After three weeks divided between London and Chamonix we returned to Australia to attend Antony and Vanessa’s Australian wedding celebration in Melbourne. 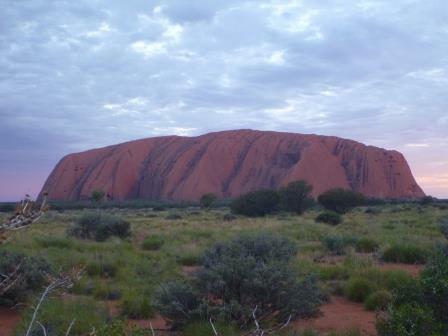 We had a few days to spare before going to Melbourne so after passing through Sydney staying again in the fabulous Gibson apartment we took a trip by air to Uluru /Ayers Rock the red centre of Australia. Although quite touristy now the unusual natural beauty is quite stunning. We hiked and biked and saw sunrise and sunset views of the rock from various viewpoints and learnt more about Aboriginal traditions and ideas. It was then on to Melbourne and we were royally entertained by Antony’s family, sumptuous dining and a trip to Healesville sanctuary to see koalas and kangaroos. 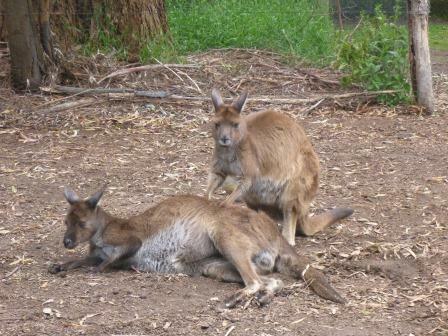 Of course no visit to Australia is complete without seeing these extraordinary and unique creatures close up. 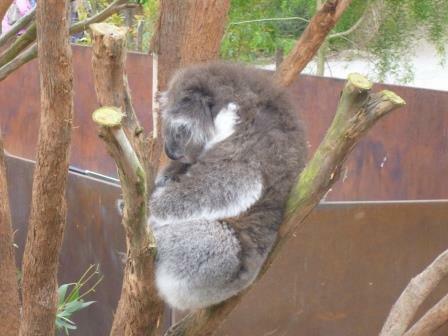 Koala bear- asleep as usual! The finale of our visit, the wedding party on Saturday 9th November was excellent, a delicious tapas spread prepared by Antony’s sister and mother. Antony made another amusing speech, but John was off the hook this time! Now it was time to return to the boat, but we could not resist another look at the views from the Gibson’s lookout en route. 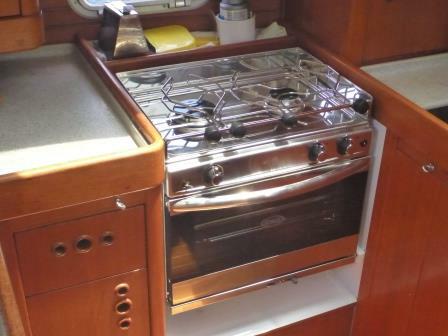 The boat was in good shape on our return even more so when we had installed the new cooker. 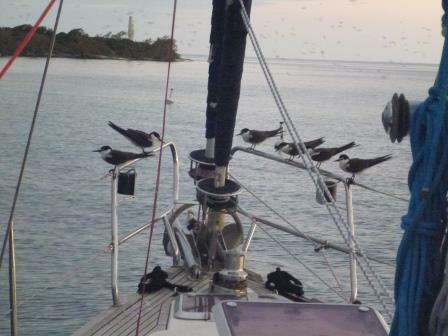 We provisioned and waited for the right weather for the crossing from Noumea to Bundaberg in Queensland. Luckily we had to wait a few days so used the time fruitfully to clean the hull while at anchor off Ilot Signal one of the many beautiful tropical island in the New Caledonia lagoon ( the largest in the world) which also had a large population of different migratory birds all chatting especially at dusk.The copper coating antifouling we had put on in Turkey 5 years ago had now worn off so it was hard work cleaning the growth off the hull and John needed to use the diving air cylinder to reach those parts others could not reach. some of the thousands of birds resting on our bow; they slept there all night. We had the green light from Emmanuel to leave on Wednesday 16.11.2016 so reluctantly we departed via the Passe Dumbea and there was no going back once through .We had met another boat, Platinum IV while at Ilot Signal and as they were sailing the same route we had a radio “sked” twice daily with them for the journey. The voyage started peacefully under motor for the first 3 hours but as expected the wind gradually picked up to the usual 25 kts and the waves came with it . Initially the wind came from the SW so we could keep slightly north of the rhumb line but by the following day the prevailing SE trades arrived with increasing strength and larger waves but comparatively easy especially sailing downwind .We made good speed 7-8 kts and the miles passed under the hull . We also had 1kt west flowing current to help .We unfortunately lost our northing by keeping the big jib up too long to maintain speed and not sailing sufficiently down wind . We were contemplating jibing on the last night as we approached the coast but were overtaken by rather a sudden unannounced storm and had to dump the main quickly and so were able to jibe round easily on the small self tacking jib alone . It remained rough for about 3 hours impossible to sleep and as we did not want to arrive in darkness we sailed slowly with the furled little jenny rounding the cardinal mark on the reef north of Fraser island around 02.00 on Monday 21st November .We entered Hervey Bay but our hopes for some shelter from wind and waves was ill founded , there was none ! With the morning light we finally spotted a very insignificant hill on the horizon very unprepossessing and would never have led any early navigator to expect it could represent the giant land mass of Australia .Compared with the approach to New Caledonia with a long stretch of high mountain ranges it was rather unimpressive, nevertheless we were glad to see it ! By noon we were entering the river mouth still in quite rough conditions but once in the river itself the water did become flatter and the entrance was easy to follow marked clearly with an avenue of buoys . We checked in by radio and decided to anchor for the rest of the day and that night in the river opposite the marina, the staff were pretty busy with arriving yachts ,the final exodus before the typhoon season and we wanted to rest and clear up after the voyage . We went in the following morning with help on hand and the entry administration was completed easily as all the officials came to us rather than us tramping around gloomy offices. 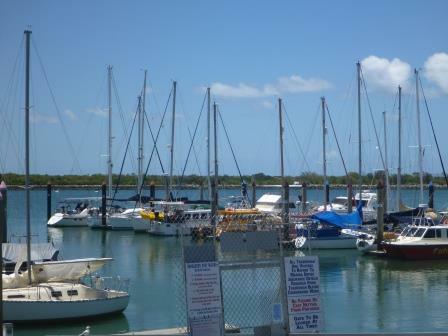 The Port Bundaberg marina was excellent with good pontoons, a nice restaurant, clean bathrooms, a large area for storing the boats on the hard and very helpful staff. 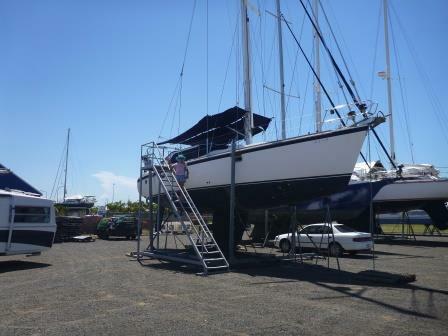 Bundaberg marina pontoons. Baringo just visible at the end. Baringo on land with a grand set of stairs provided! 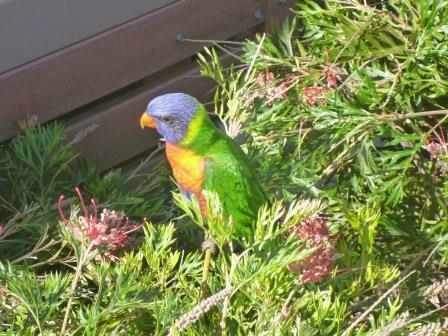 Rainbow Lorikeets abound in the area. So we had crossed the Pacific and what an ocean it is, so empty and so interesting to explore. It is an unforgettable experience and there is a tinge of sadness that it is over. Our plans for next year are uncertain, the idea of cruising the Australian coast is quite attractive or possibly returning to New Caledonia for the season, or head to Singapore to complete our circumnavigation ……probably the decision will be made for us ! fascinating. 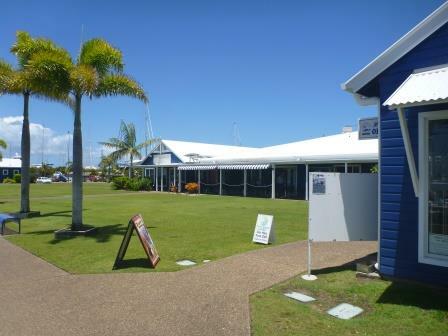 Especially the unprepossessing first view of Australia at Hervey Bay. Cook, did he have a similar first view? I think those Terns on the bow are Sooty Terns. We saw thousands of them on the Omani coast. The long strand was literally black with them. Wish you both ell for Christmas and an exploratory New Year. Thanks Jeremy for the good wishes and for indentifying the birds on the bow pulpit. we have just arrived in France this morning from Australia and a bit jet lagged. Will give you a call soon. Hope all ok. Many thanks for this. Delighted to see another Wauquiez as well. I have just sent you an email, hope you get it.